Tremendous Value in a perfect begiNNER SEt up! This package Features the Cabrinha Drifter 2018 12m Kite - A very Stable, Predictable kite with Excellent Re-launch. Billed as a "wave" kite, the Drifters ability to almost fly itself and super easy relaunch make it a great kite for the first time kiter. Also a great Foil Kite! 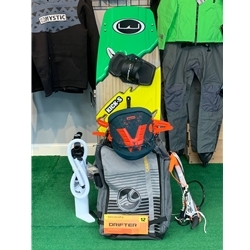 There are many choices for Boards, Pictured is what I think is a great choice for the person looking for something that is easy to ride, Handles Chop well and tracks upwind extremely well, but also have great performance for jumping and carving turns. 2018 Litewave Bio-metric Bindings "straps and pads"
The all-new design of the 2018 Cabrinha Drifter preserves its legendary drift stability while widening its range of use. With a new lighter bar pressure option and Onshore and Offshore settings, the Drifter performs in any and all surf conditions. And when it comes to surf freestyle the Drifter gives you the pop and control needed to perform at the highest level. Our all around Kick-S twin tip is back again with a brand new style for 2018 featuring legendary Litewave quality, new colors, and the same bomber construction as previous models. Our bullet-proof core uses a vertically laminated Paulownia wood/epoxy construction, which utilizes a uni-directional glass and Carbon Stringers composite to deliver the perfect blend of low weight and easily controllable flex that delivers huge load-and-pop capability.